We love grilled brats around here, and my favorite brand is Johnsonville. They don't try to make and sell everything under the sun. Johnsville sells sausages - period. And, darn good sausages. Grilling bratswurth (or bratsworth) is very simple, but the type of sausage you buy does make a difference in terms of how you grill your brats. If you're not sure how to grill brats, then check out my Grilled Brats Guide. It's always nice to be styling when grilling at home or when tailgating at a ballgames or NASCAR race, so start saving your Johnsonville labels. If you collect four proofs of purchase, you can mail those in for a Free Johnsonville T-Shirt. Details on the deal are in the right hand corner currently. 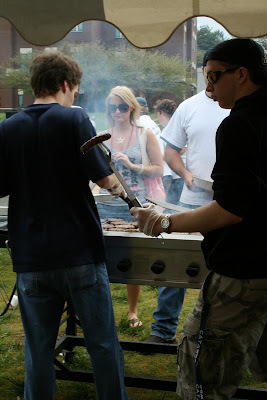 Get yourself a free t-shirt and enjoy some tasty grilled brats. That's a real win-win!